Soak in the Jacuzzi tub and watch a movie or marvel at the spectacular oceanfront views all without leaving the comfort of your private North Myrtle Beach condominium at North Shore Villas 504. This exquisite oceanfront vacation rental property is beautifully furnished and offers all the creature comforts of home. 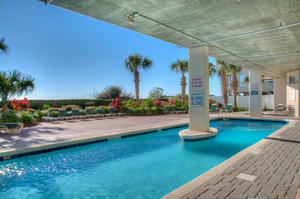 It is a three-bedroom, three-bath vacation rental condominium that boasts accommodations for up to 10 people. 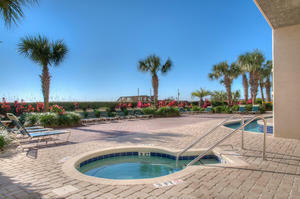 This North Myrtle Beach vacation condominium rental has a fully-furnished kitchen with full-size appliances. 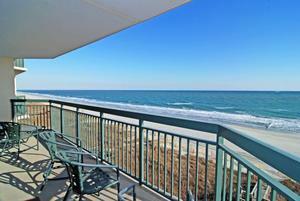 There is a convenient breakfast bar in this oceanfront condominium rental. The living room is ever so plush and very inviting opening up to a beautiful oceanfront balcony that boasts views of the Atlantic Ocean. Spend time relaxing on the outdoor balcony and enjoying the marvelous views during your North Myrtle Beach vacation at North Shore Villas 504. Pamper yourself with a soak in the Jacuzzi tub at this North Myrtle Beach vacation rental condo and worry not about the laundry as there is a washing machine and clothes dryer in this condominium rental for your convenience. DVD players, high-speed Internet access and balcony access from the master suite are all part of this oceanfront vacation rental condo. The North Shore Villas Resort has an oceanfront sun deck that features a sparkling blue swimming pool, kiddie pool and lazy river. The white sandy beaches are just beyond the swimming pool area so follow the dreamy path to the white sandy beachfront and play like a child in the white sands all day long. 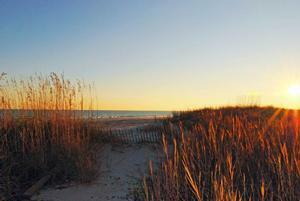 Fish from the nearby pier, swim in the ocean and dance at the beach clubs to live beach music. Live entertainment theatres, championship golf courses and shopping are just minutes away from North Shore Villas 504, a tropical vacation rental condo by the sea.